Barrie Patman started his career in the air transport industry and was an active member of the Chartered Institute of Transport. He moved into the Telecommunications and Computing area and became a Principal Consultant with the BOC group. He became active with the British Computer Society and was a founder member of the Operations Management Specialist Group and has written books on this subject. He was the company's representative on the National Standards body and helped to develop new National standards for systems Analysis and Design. He has been responsible for providing training in various IT areas (programming, Analysis and design). He moved into the Computer Database industry and worked for Oracle Corporation for a number of years during that time he had worldwide marketing responsibility for some of their products. He worked for Cable and Wireless in a role co-ordinating internal activities and is now an Independent Consultant. Barrie has a keen interest in sporting activities which include Sailing and Fencing. He was Captain of the Middlesex fencing champion for six years running and was a member of the South East England and Southern England teams (including a period as captain). 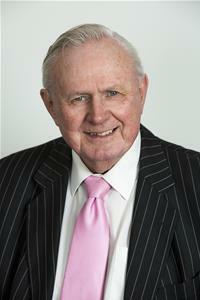 He has been involved with local government since 1979 and has been Chairman of Winnersh Parish Council and Chairman of a School Governing Body. He is currently Deputy Mayor and Senior Member of the Thames Valley Police Authority.